Since 2015, Europe has been in a migratory crisis of unprecedented scope. Faced with this challenge and supported by the generosity of many neighbors, the community continues to open its doors to welcome migrants. 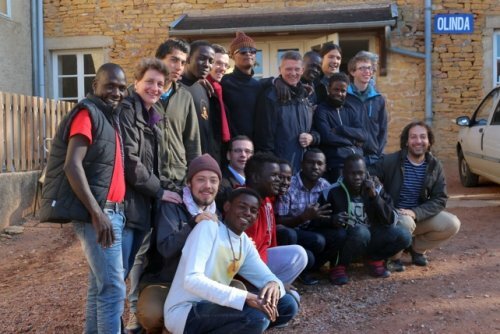 In November 2015, to welcome migrants from Calais, a so-called CAO (reception and orientation center) was opened in Taizé. This place was able to accommodate thirteen young men aged 19 to 40, all Muslim, from Sudan and Afghanistan. Nine of them, who have been granted refugee status, are now working or training in the region around Taizé. One of them, widowed, had a 13-year-old son in Sudan. On the occasion of his visit last year to that country, Brother Alois brought the child back to his father. He is now attending school and his father works in a foundry of the region. 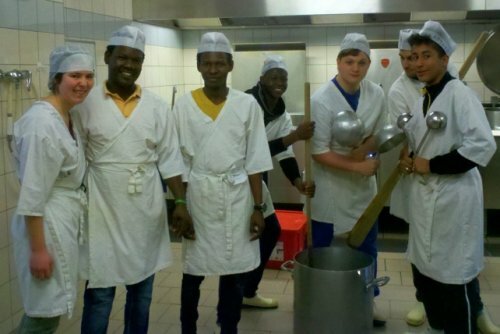 In November 2016, the community opened a CAOMI (reception center and guidance for minors) to host for a time eighteen young minors from Calais, who wanted to go to England. 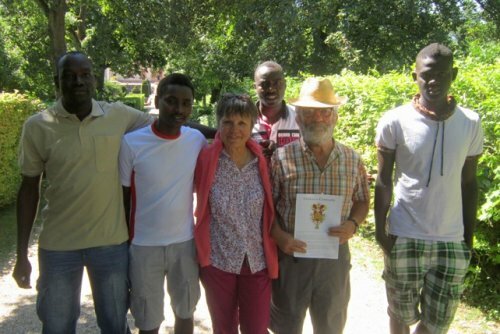 Seven young people decided to stay in Taizé for their asylum application procedure. One of them is now in an educational center near Taizé and four refugees are still living in the village, seeking to settle in the area. In recent years, the community has also welcomed four refugee families from Iraq and Syria. After several months in Taizé, which allowed them to regain their autonomy and begin to be integrated well in France, two of these families settled elsewhere, keeping an almost family-like relationship with the community. Last September, the community welcomed three young migrants from South Sudan and Sudan, aged 20 to 28 years. These young people do not yet know if they will be able to make their asylum application in France because of the Dublin regulations. In the meantime, since they do not have permission to work, they are learning French, do volunteer work and participate in exchanges on the causes and difficulties of their migratory journey. When the community opened its doors to young people from Calais, immediately a great generosity on the part of the inhabitants of the region was manifested. Today, French classes are offered four days a week at the Taizé town hall and a dozen volunteers take turns to give classes. Christine, a teacher of French as a Foreign Language (FLE), writes: “My great astonishment and my great pleasure is also to see the motivation of the asylum seekers and their commitment to learning French, despite all their other concerns.” In addition to the three migrants who participate today in the courses, a dozen foreigners from different countries living in the region also benefit from the quality of these courses. Migrants welcomed in Taizé were invited to lead a day of reflection on migration at Saint Joseph High School in Châteaubriant, Brittany. In November 2017, three of them went there and the high-school students were impressed by the story of these young people who crossed the Sahara, and the experience of hell in Libya and the Mediterranean. The migrants were likewise impressed by the quality of the listening and the seriousness of the students. In Taizé, migrants sometimes participate in the workshops offered to the young pilgrims, where they can share their background and motivation. 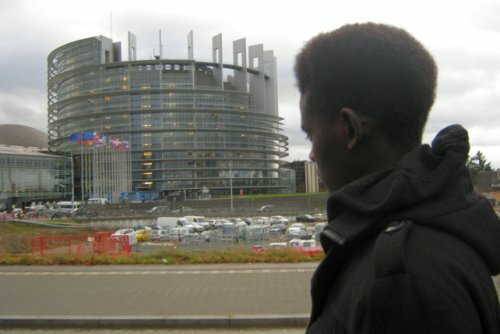 In January 2018, a group of young migrants visited the European Parliament. During a meeting with the European Commissioner for Migration, with members from different parties and from different countries and with the Director General of the OFPRA (French Office for the Protection of Refugees and Stateless Persons), migrants were able to talk about their reception experience in Europe and their respective situations: statutory refugees, asylum seekers, “dublined” migrants, and unaccompanied minors whose age has not been recognized. To watch a longer clip of this meeting, click here. Migrants welcomed in Taizé have always been happy to lend a helping hand around them and to feel useful in fulfilling a service for others. They regain dignity when they can give something of themselves.